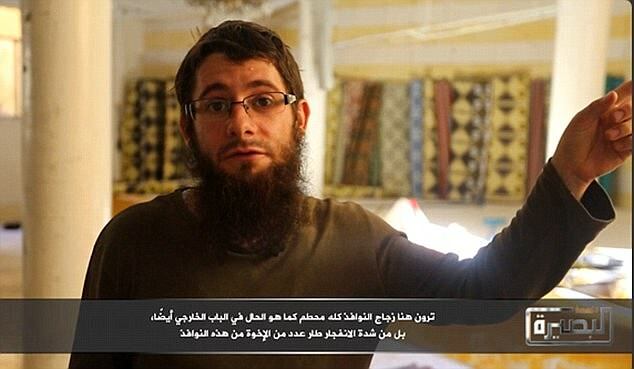 The white British son of a film director who converted to Islam to join al-Qaeda in Syria has called for more recruits to join him in a new propaganda video. In the footage, London-born Lucas Kinney, 26, addresses the camera in Arabic as he stands in front of a group of jihadi fighters. The 26-year-old encourages people to join him in the war against President Assad’s government forces. He is the only member of the group who leaves his face uncovered. Kinney has become a figurehead of the Syrian al-Qaeda-linked group Jabhat al-Nusra, and has starred in several propaganda videos posted online under the nom de guerre Abu Basir al-Britani. The first white British convert to emerge in Syria, as a Home Counties schoolboy he took holy communion at a Roman Catholic church and attended Catholic primary and secondary schools. As a teenager, he even spoke of being a priest. His father Patrick, 59, worked closely with Steven Spielberg on films including Indiana Jones And The Last Crusade and was assistant director on a long series of blockbusters. Mother Deborah Phipps, 53, who was divorced from Lucas’s father when he was still at primary school, told yesterday of her dread that her son will be the next Briton killed by a RAF drone strike or in a Russian bombardment, and her fears that he might become a suicide bomber. Mrs Phipps, who receives occasional emails from her son, is at a loss to explain how he went from a bright, normal teenager to a Muslim fanatic. After leaving school he attended Leeds University but dropped out after a year. He played in a series of rock bands then went to live with his father in Vienna. It was there that he is believed to have been radicalised. He is now a figurehead of the Syrian al-Qaeda-linked group Jabhat al-Nusra, and has starred in two propaganda videos posted online under the nom de guerre Abu Basir al-Britani. Mrs Phipps, who now lives with her second husband in a honey stone executive home in the West Country, with a smart Jaguar parked outside, told the Mail her jihadi son faces continual danger. Threats include rival Islamists Islamic State – who could capture him as a British trophy – as well as the Syrian army and Russian bombers, and also from RAF drones which have been used to assassinate UK jihadis there. Mrs Phipps said: ‘Lucas is a target. I’m glad he’s associated with al-Qaeda rather than IS, but obviously I worry. ‘On Mother’s Day last year I spoke to his father and he told me he thought our son was dead because there was a picture of him on the internet lying on a bed in Syria and you couldn’t tell if he was alive. ‘Later that day we found out he wasn’t dead but was seriously injured. He’d been struck by a mortar so his arm basically was hanging off. He had to have a big operation and he said he wouldn’t be able to fight for about 18 months. ‘I last heard from him recently. I don’t get anything for months and months and then all of a sudden I get an email and every time I think, ‘Well, at least he’s still alive’. That’s the relief. ‘He’s married out there. I don’t know anything about her. They don’t have any children as far as I know, but this is recent, the last few months. Most British jihadis in Syria are born Muslims of overseas descent – but the existence of a white convert only emerged online several months ago in the two Jabhat al-Nusra videos presented by ‘Abu Basir al-Britani’. Not until today has he been exposed as Lucas Kinney. Bespectacled, calm and well-spoken, he sounds very much England-born as he talks about the atrocities being carried out by Jabhat al-Nusra’s rivals ISIS. Both films are journalistic in style in contrast to the crude attempts at visual terror in IS videos. One of Kinney’s professionally produced videos is entitled ‘So the Way of the Criminals Will Become Clear’. In it, he visits the scene of an IS attack on a mosque in a Jabhat al-Nusra area of Syria, but adds with the faith of a fervent convert that the ‘good thing’ for his murdered ‘brothers’ is that ‘Allah chose to take them in a very good time. He gave them an honourable death’. Referring to Islamic State, Kinney says the group ‘is not deserving of that name’. His broadcasts are designed to encourage other Britons to join his al-Qaeda group in Syria, a criminal offence in Britain….